Are you planning to have a Freshwater Aquarium Setup, but not sure how to set up an aquarium for tropical fish? Here’s a complete guide that will help you to setup up your very own Tropical Fish Aquarium. Planning: Planning is the important aspect of any aquarium setup.This Freshwater aquarium setup checklist part will help you understand what is required to get started. Setup Instructions: This part will help you with the actual setup of the aquarium. We also have included some of the frequently asked questions at the end of the post. 3.2 Which fish species should I Stock? Indeed, everything starts with a plan. To enjoy a lifelong hobby in freshwater aquarium fish keeping, a good master plan is a must! So before starting with Fresh Water Aquarium Setup, a good plan will help you set up your aquarium effectively. You will be able to figure out the necessary equipment, freshwater fish species to stock and many other important details that you need in setting up an aquarium. Homework? Yes, we literally mean it… One of major freshwater fishkeeping failures can be attributed to the aquarists’ ignorance about the types and information of fishes they are trying to keep. It is important to note that the moment we acquire a fish we become responsible for its welfare. Therefore, no matter how expert one becomes, homework is the topmost agenda for every aquarist in achieving their goal. What size and shape of an aquarium can I accommodate and afford? Is there enough room to house the aquarium? Where is the ideal location to place my aquarium? What type of fishes(cold water fish species or tropical fish species) would I like to keep? Would I prefer a community aquarium or a specific species? Do I want to grow plants? The questions do not stop here, so we would recommend you to consult your fishkeeping friends or local dealers and learn more from their setup and experiences. In our experience, they will be only too happy to even let you see their set-ups and share their experiences. This might help you figure some aquarium setup ideas for yourself. The types of aquarium fish you would love to keep. The type and the number of fish that you are planning is a good gauge to determine the size of the aquarium you require. Choosing the aquarium of an appropriate size would prevent overstocking of the fish. So whatever the size of the aquarium you may choose, it is always good practice overstocking. Since not only it would not only inhibit and harm your fishes but also may lead to increase in mortality rates. Once you have determined the type of fishes and the size of aquarium, the next you would want to do is fixing a budget for the aquarium setup. From our vast experience in fishkeeping, we could say that you would be amazed by the quantity and variety of equipment available in the market. Certainly, you are not required to have all the equipment listed above, you could determine what you require based upon your plan for Freshwater Aquarium Setup. Now that we have done our planning and preparations also have the Aquarium (Fish Tank) and the set of equipment required ready we could go ahead and set it up. Find a base strong and steady enough to withstand the entire weight of your aquarium. A fish tank filled with water is extremely heavy, so choose your base wisely. Keep the tank in a location which is convenient for maintenance. So that you could carry out activities like water change easily. Keep the filter near to the electrical outlets. Keep your aquarium away from drafts and windows since direct sunlight. As sunlight would encourage algae growth and can affect aquarium water temperature. Keep the aquarium away from busy hallways or rooms to prevent sudden shocks that adds stress to the fishes. Keep the aquarium away from the places that may cool or overheat the tank. Clear the designated location where the fish tank will be placed. Wash the inner and outer surface of the tank with a soft sponge with only water. At the same time check for leaks. Personally, I prefer to use warm water to wash the new tank and also when performing tank overhaul. Warm water may help to dissolve any harmful chemicals or residue left behind in the tank. Rinse the gravel thoroughly with clean water in a bucket to remove dirt and unwanted particles with the help of a strainer. Wash all decorations under clean running water. Decorations such as driftwood, rocks, and shells may need to be scrubbed to remove dirt and any parasites present. Add and secure rocks or wood decorations and arrange them as planned. 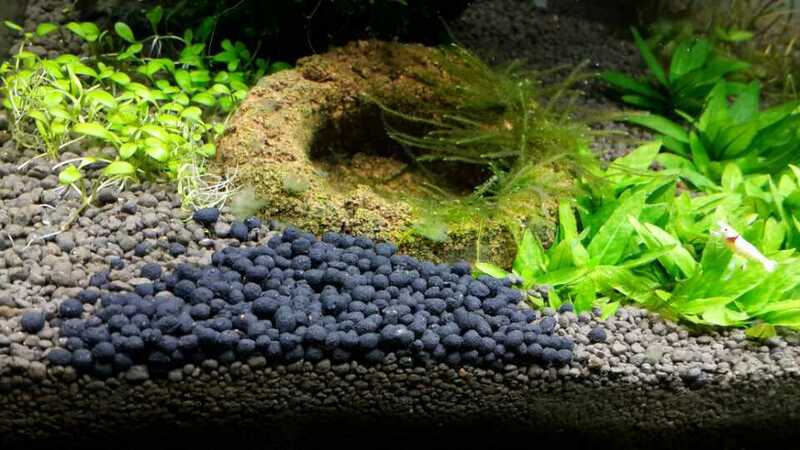 Then, add base fertilizer for planted aquariums. Add the gravel and create a contour by sloping the substrate towards the back of the tank. Arrange the rest of the decorative items as desired and avoid leaning them against the aquarium’s walls. Install the aquarium filter, heater, and thermometer. Carefully fill the tank with water and run the stream onto a rock or a saucer so as not to disturb the gravel and decorations too much. If you are using plastic plants, you can put them in at this time and arrange them as desired. Hook up the filter and adjust the heater’s temperature accordingly. Then, turn on the aquarium filter and plug in the heater to check if everything is working properly as expected. After that, leave the setup to stabilize for a couple of days. Your initial freshwater aquarium set up should have been stabilized after a few days. Live aquatic plants can be added at this time. But before you do so, for safety reasons turn off all electrical equipment to avoid being electrocuted. Wash all plants under clean running water to remove unwanted deposits or parasites. Decayed leaves and rotten roots should be removed. Start by planting tall plants along the rear of the tank, and low-growing plants in the front. Install the overhead lighting hood, turn it on together with the filter and heater. In order to establish a healthy environment for the new inhabitants, allow the aquarium to stabilize again for a day or two before introducing your lovely fishes. Depending on the type of fishes you are keeping, is good to check the water temperature and perform water chemistry test(especially the ph test) by using the water test-kits before adding them. This will help reduce the amount of stress imposed on the fishes as you transmit them to the new environment. For a start, and a few fishes at a time, especially hardy ones like barbs, tetras and zebra danios. As fishes are transported in a plastic bag, float the bag on the water surface for at least an hour to allow the fishes in the bag to get acclimatized to the aquarium’s water temperature. Then open the bag, slowly and gently net the fishes from the bag into the tank. Be careful, Do NOT pour the water from the plastic bag into the tank. This to minimize contamination as the water in the bag may be treated with medications from the aquarium shop or pet store. Do NOT feed the fishes immediately, allow a day to let them get adapted to their new home. You might also want to consider the adding some invertebrates to your fish tank. The freshwater aquarium cleanup crew like snails, shrimps, crabs, clams help to control the built-up waste in your aquarium. Detritus – Organic waste, uneaten fish food build, builds up in your aquarium overtime affecting the quality of water. These invertebrates naturally feed on detritus helping you keep your aquarium clean. Now your initial freshwater aquarium set up has been completed and it is time to start caring for your fish. Your aquarium would go through a “cycling” process. Once the current inhabitants get acquainted with their new home, new fishes can then be added, but a few at a time. Q: I am a beginner. What is the right aquarium size for my tropical aquarium setup? A: It has been advised that a small tank setup (eg. a 10 or 20-gallon tank) is more suitable for beginning aquarists rather than a larger tank setup (eg. 55-gallon tank and above). I humbly beg to differ. In my opinion, there is no basis to this advice unless your intention is just to keep a few fishes, then a smaller tank would suffice. In fact, large tanks are easier to maintain than small tanks. The reason is that the larger the tank, the more stable the water chemistry and temperature will be, which will cause the least amount of stress to your fish. Besides, you can afford to stock more fishes or variety of fishes in a large tank. Moreover, large tanks have higher water volume for waste dispersal, a larger surface area for the waste breakdown. Also, the water’s PH tends to be much more stable, and less frequent water changes which in turn reduces your water bill. Furthermore, if you are using live aquarium plants as part of the aquarium decor, space is an important factor to allow some plants with high growth rate. This is especially essential in freshwater aquarium setup to balance the environment in the aquarium. Therefore, my personal advice for beginners who are seriously considering a hobby in freshwater aquarium fish keeping, to choose as large a tank that you can accommodate, economically and space-wise. Which fish species should I Stock? Q: I am just getting started wiith the hobby… Which fish species can I start with? A: It’s best to set yourself up for success on the front end, and a small community of low-maintenance fish is the way to go. Swordtails, mollies, platies, zebra danios, and corydoras catfish are hardy, easy keepers and are pretty inexpensive to boot. These fish also have the benefit of allowing you to choose their color, something that would likely cause some controversy in people communities. Do refer to the fish compatibility chart to know about the species that are compatible. As your knowledge and experience grow, you can wade out into deeper waters. Try tinfoil barbs, Brilliant Rasbora, silver dollars, red hook metynnis, and Australian rainbow fish. Some of these fish will be a little more expensive, but they add color and beauty to a tank. Once you feel confident that you know how to care for them, the added expense will be well worth it. Fish are pretty flexible, though, and as long as you make the transition gradual, they can live out of their initial comfort zone surprisingly well. The groups above can even live in the same community if you bridge their preferred pH levels to reach some middle ground. What a great world it would be if we were as easy-going as some of our fish.